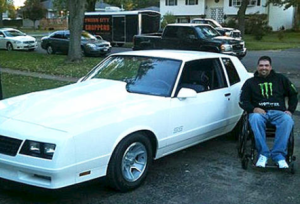 Mike Allen of Joliet has been working on his 1984 Monte Carlo SS for three years. Restoring an old muscle car is hard work for anyone, but even more so for Allen who is a paraplegic. So when Allen came home from a family dinner to find his garage broken into and his car gone, he was devastated. What Allen didn’t know was that the “theft” was actually a scheme by a group of friends to get the Monte Carlo restored, up and running, and fitted for Allen to drive. The scheme was concocted by Minooka resident Joe Zolper, owner of Prison City Choppers. Zolper and Allen are both members of Prison City Mafia, a custom club for cars, bikes, boats … you name it. The club of about 30 members got together and planned the heist. They got a lot of people involved, Zolper said, from the Joliet Police Department to Allen’s insurance agent. They informed his neighbors and got his wife Lisa to leave the garage door unlocked that night. “Pretty much everyone [was in on it] but me,” Allen later said. While Allen was out to dinner, club members towed away his car. They made a huge mess of the garage and broke a window to make the theft look real. They even took his collection of radio-controlled cars.